Years before the Globe and Mail declared Oakland the “Brooklyn of the West,” in 2012, citing among other cultural draws its “exuberant art;” or before ArtPlace designated Oakland’s downtown neighborhood as one of America’s top 12 Art Places, earlier this year; or before the New York Times noted that Oakland’s first Friday art event, Art Murmur, was a key component of turning Oakland from “seedy to sizzling” in 2010, then in 2011 mentioned Murmur as a component of Oakland getting “a new ‘there'” and finally, last year, ran a full story about the event titled “A Monthly Night of Art Outgrows its Name”–years before all that, Fred Neal began building an art collection focused primarily on East Bay-based artists (in addition to a few artists from further afield in the Bay Area). Today Fred Neal, an engineer by profession, holds “somewhere around 300 to 400 or so pieces of art,” as he stated in a recent interview. “I’m not sure though; I’ve never catalogued all of it.” Exact numbers aside, the collection contains more than enough to fill just about every inch of wall space in Neal’s modest Albany home (just north of Berkeley); “I rotate the work,” says Neal, “and I loan art out to family and friends.” In his designated art room, he keeps racks of stored works and a flat file case that is literally bursting with photographs and prints. Prints, drawings, paintings, photographs, and wall sculpture hang throughout and sculpture sits beside the many pieces of his glass collection (procured from the region’s glassblowers). And Neal’s taste varies widely: there are abstracts and landscapes, colorful pieces and black-and-whites, traditional wood-block prints and images made with a scanner, funny works and serious pieces, Latino protest art, and work by both young up-and-comers and established artists. Among the numerous works hung salon-style in the family room are a bright, minimal abstraction by Mills College MFA graduate Brian Caraway; in a nearby hallway is one of Oakland-based artist Peter Foucault’s abstracts, the workings of a robot; and, in his office, is a large photograph of a decaying building by Katherine Westerhout, who is also based in Oakland. When asked what guides his purchasing, Neal simply responds, “I buy what I like.” He also mentions that he keeps himself to a strict budget (most of the pieces were bought for under $1,000), and he buys work from young artists, early in their career. It’s a collecting style (and zeal) reminiscent of Herb and Dorothy Vogel. But it wasn’t until about 10 or 15 years ago that Neal started collecting in earnest; it was at that time that he really started to delve into the Oakland art scene, inspired by Kerri Johnson at, first, the Oakland Art Gallery (OAG), then (the now closed) blankspace (also in Oakland); “It was Kerri who really got me hooked on the Oakland art scene,” says Neal. “I collected heavily from her.” (Johnson, an artist herself, is now co-director of Branch Gallery, Oakland, and a founding partner of the Bay Area Visual Art Network, BayVAN). Another space Neal frequented then and still does to this day is the long-running Pro Arts (which joined forces with OAG in 2009). 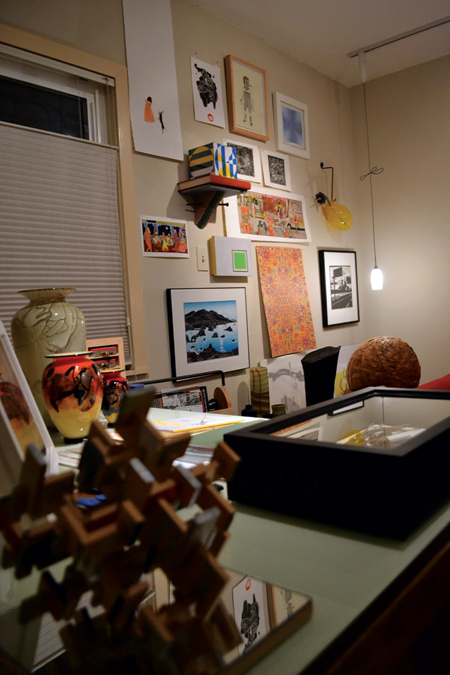 Within his collection, Neal has work from over 100 artists–including, to mention just a few, Hunter Mack, John Vias, Ann Weber, Misako Inaoka, Deth P. Sun, Jon Carling; “I have a lot of favorites,” says Neal–and a list of artists he wants to collect from, most of whom live nearby. When asked why he sticks close to home, he notes his interest in getting to know the artists; not only are there numerous galleries where he can find work but also loads of studios to visit.